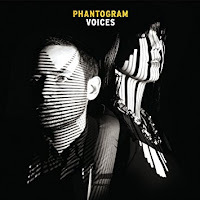 Phantogram is a duo who began to pick up steam when they signed with a major label in 2013. I doubt they will ever be mainstream but they have done well on tour. Phantogram is from the upstate New York town of Greenwich and they live in Saratoga Springs. Josh Carter and Sarah Barthel went to high school together. After briefly separating, they returned home and started working on songs together. Sarah sings and plays keyboards. Carter plays guitar, bass and drums in the studio. They hire musicians for touring. At first they performed in local clubs as Charlie Everywhere and that was changed to Phantogram in 2009. After releasing a couple of EPs, they signed with Barsuk Records for their debut album Eyelid Movies. The album was reviewed positively. They also wrote and produced a couple of songs for Big Boi from Outkast. It was enough to get them a deal with Universal's Republic label for the 2014 album Voices. The album and a couple of singles did well on alt rock charts. But they haven't crossed over to mainstream yet. To promote Phantogram, songs have been placed in TV shows. Black Out Days appeared on CSI: Las Vegas, Shameless and The Magicians. The theory is fans use that to find Phantogram on Spotify or iTunes. That strategy must be successful or labels wouldn't do it. For their 2016 album Three, Phantogram worked with producers Ricky Reed and former Semisonic leader Dan Wilson in an attempt for mainstream success. But Three didn't sell as well as Voices. Phantogram are on tour. My guess is they will record when the tour is over. Maybe Republic should leave them alone and let them make music minus outside producers. That seemed to work well for Voices. Here's the video for Black Out Days by Phantogram.